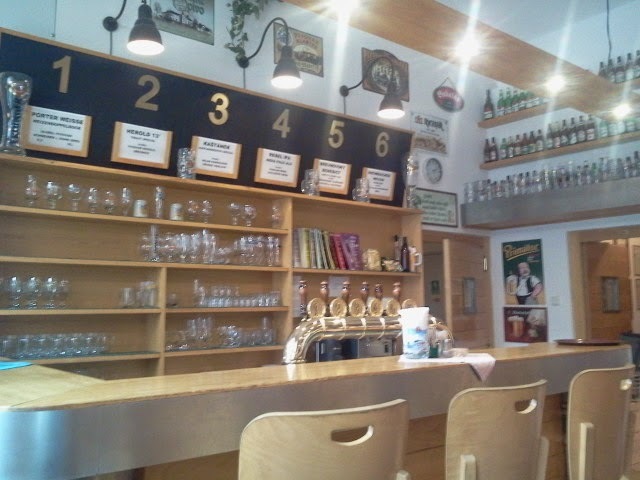 I went to Pivovarský Klub for lunch on the day of my flight back to Hamburg. I was planning on going there sooner, but it just didn't work out. It was around the corner from the hotel I stayed in the last night I was in Prague, and I had walked by the night before to look inside, but didn't feel like having a beer at that time. I did see after looking in the window that I'd have to go back the next day. We arrived around 2 and it was fairly empty. I had already looked at the menu online a few times so I knew exactly what I was planning on ordering. The only thing I wasn't completely sure of was which beer to get. 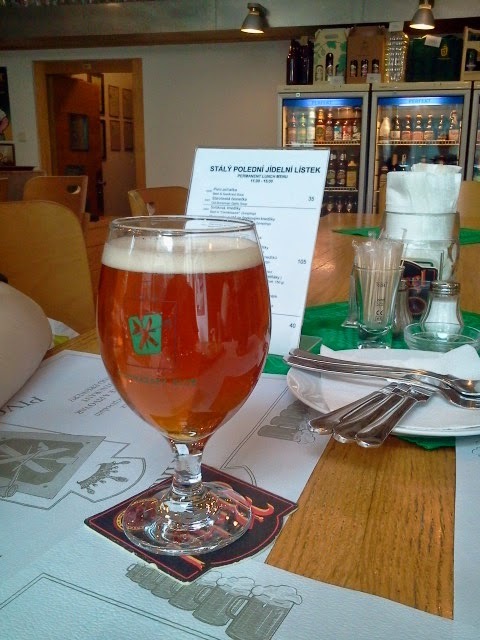 I decided to go with the Herold Cerny Lezák 13° figuring it would match well with my Brewmaster´s Goulash with Bacon Dumplings. My lady had gotten some food earlier as the vegetarian selections were limited here, but she did have a Rambousek Eliščino Královské 13% Kaštanomedový Speciál. 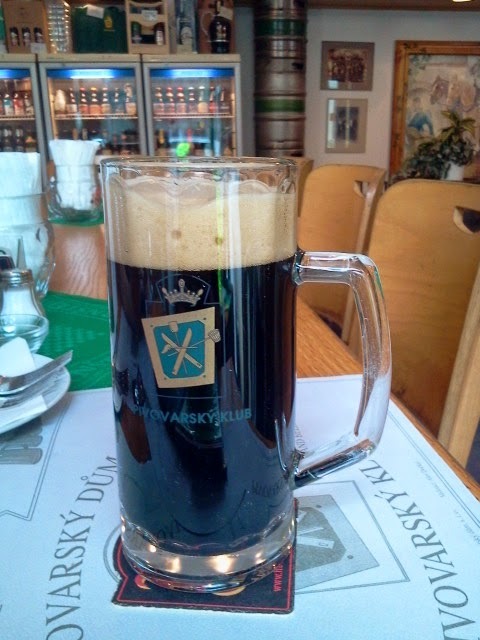 Shortly after I placed my order I was greeted with a half liter of dark beer and just moments later an ample plate of food. The food and beer worked pretty well together, and I had forgotten how much I like dumplings. 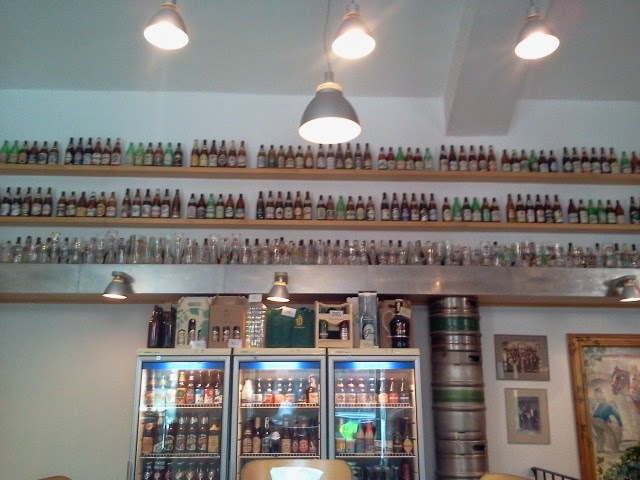 The only real downside was that I was short on time and wouldn't be able to spend time looking over their extensive bottle menu with over 240 beers. I purposefully ate my meal but still took time to savor it. 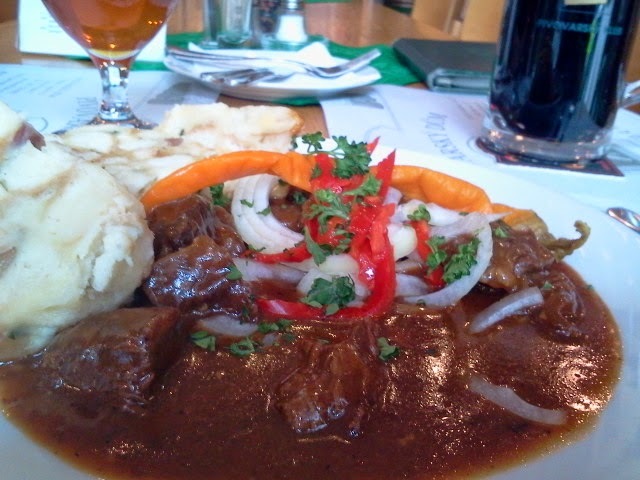 Lunch here is very cheap and two beers and an entree were less than 200 CZK. I took a quick look around downstairs before I left. There was another bar with the same draft beers on offer as well as several more tables. Overall this place was small so I would imagine finding a table on the weekend could be difficult. 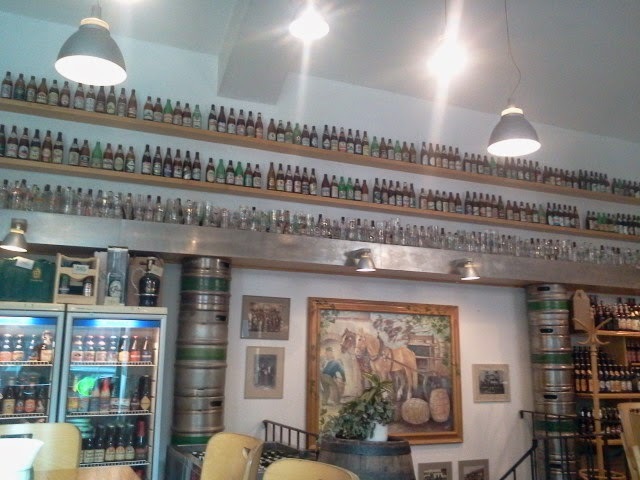 The upstairs has a corner dedicated to their bottle selection which also served as their bottle shop. 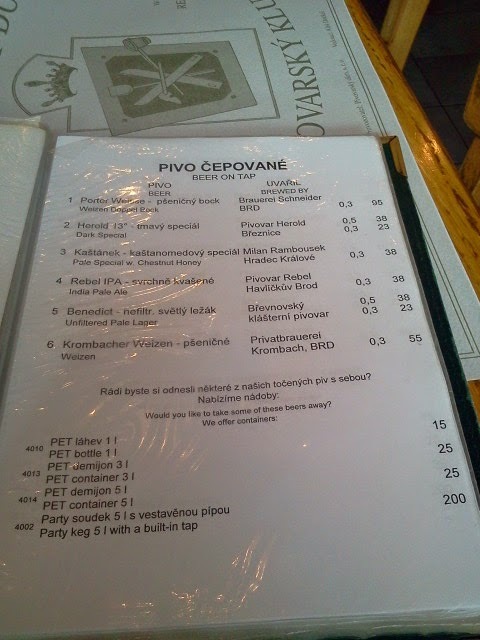 I'm not sure how much the price varies for drinking in the store or take away, but overall the prices in the menu for bottles were mostly reasonable. The selection seemed to consist of more common Czech, German, Belgium, and UK offerings, so I'm not sure if this would be a great place to stop if you are looking for a bottle shop. I love that this place doesn't allow smoking. I was impressed that their website has a cigarette with a line through it in the top corner. Way to many places in Prague are overly smoker friendly, so it is great to have a place that doesn't have smoke wafting through the air or smell like a giant ashtray. I don't understand why a bar would offer great beer in an environment where you can't properly taste or smell it. 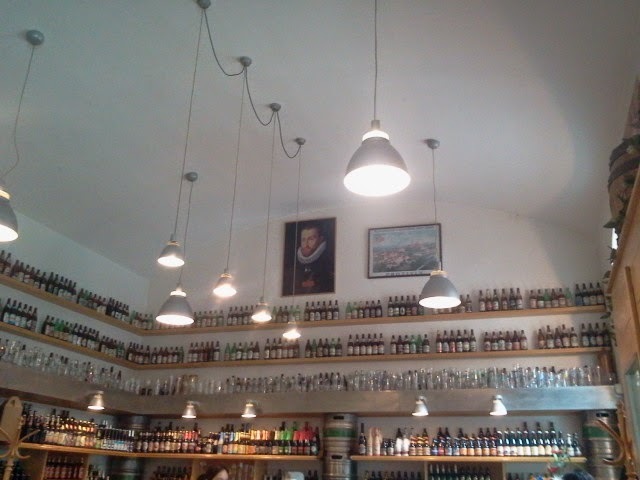 If you ever want to have great beer and traditional well prepared Czech food then this place is a must do in Prague. I could have gladly spent hours here enjoying a hearty meal with several delicious beers. Service was friendly and quick, so it would also work to stop in if you are a bit shorter on time and it is early in the day. If you don't want food that works well too, because the emphasis is definitely on the beer here. I'd imagine the six drafts are plenty considering the limited space, and it allows the beers to be consumed in a reasonable amount of time. 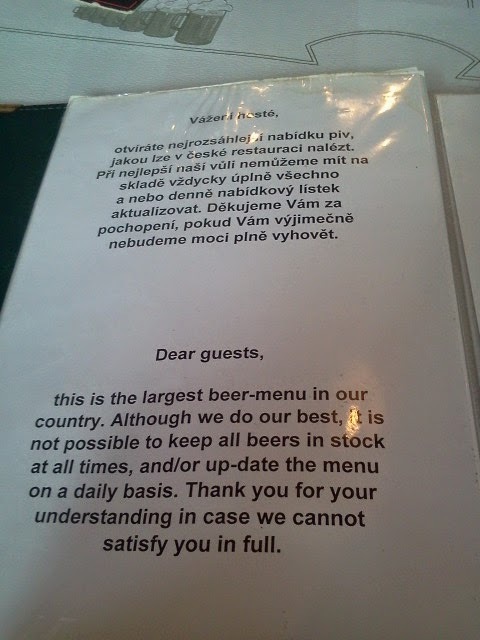 If I lived in Prague I would come here a few times a month.